Are you seeing cluster flies in the spring? Are you vacuuming up cluster flies, just to find out 10 minutes later it was like you never cleaned them up in the first place? Well you're not alone. 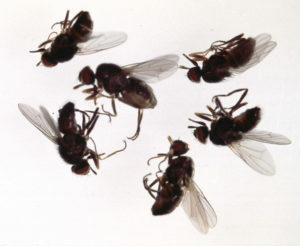 Cluster flies are annoying and can make you feel like your home is completely infested. Don't worry, Andy's Pest Control is here to help! Cluster flies use your home for warmth and shelter during the cold winter months while they are dormant, often settling in areas such as attics and in your walls. When the warmer weather heats up your home, the cluster flies get a sense of spring and start to come out of dormancy and try to head outdoors to continue their life cycle. The problem is, half of them leave the way they came in (though soffits, window and door frames, as well as roof vents and siding) and the other half (the ones you are seeing) have managed to make their way through your walls and emerge from interior window and door frames as well as cracks and crevices through out your home. Because they are attracted to daylight, it creates a large gathering around your window and door frames. So how can Andy's Pest Control help you in the spring? We offer spring cluster fly treatments. They include treating your attic space, window and door frames, as well as any cracks or crevices that can provide easy access to your living space. But Andy, how can we prevent cluster flies from entering?! Well, cluster flies emerge from the ground in the early fall months and are once again looking for warmth and shelter before going dormant. A Fall Cluster Fly treatment can help prevent them from entering your home. This includes an exterior and interior treatment of your home. This 2 step method will help eliminate any flies that have already entered your home as well as provide a barrier to stop any new ones from entering. If you have any questions or would like to book a spring treatment, please feel free to give us a call at (705) 760-3457. Can you do anything about ants? I am seeing ants crawling through the house everyday. Some are large and all are black. Hi: We live in the Northend of Peterborough and have a fly problem. We are interested in your service. What is approx your cost. Thanks very much. Do you also treat for beetles that look like lady bugs? Hi Dee, Please feel free to give us a call at 705-760-3457.